Over the last 200 years or so, circuses have been entertaining families all around the world. Traditionally circuses were a series of unrelated acts compiled together in a show to entertain and astonish. These shows historically included animal acts, but with Animal Welfare at the forefront of everyone’s minds, animals are seldom used in circuses in this day and age, and if so are closely monitored. In place of animal acts, circuses have had a modern makeover, and focus on fantastic human feats and tricks. Classic or traditional circuses keep their format of unrelated acts minus the animals and show off clowns, magic tricks and balancing acts. 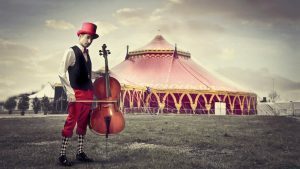 New or modern circuses take a more fluid line and tie all their acts together with an underlying theme or story, and these may include modern or traditional clowns, jugglers, trapeze, and acrobatic acts. Contemporary circuses take a concept or specific discipline and focus their entire show around this – examples of this are acrobatics, dance or aerial skills. You will also come across circus Theatre using theatrical and dramatic storytelling and shows based on the many various forms of aerial dance and practice. As there are no two shows or acts alike, we will endeavour to shed some light on a few of the shows you may come across in your search for the ultimate entertainment. Whether you want traditional or non-traditional entertainment, there is a show for you and here we will cover some British shows as well as international touring shows and what you can expect. © 2019 mrdoo.co.uk. All Rights Reserved. Theme by MyThemeShop.